Do you use dry food og wet food for kittens? Does everyone feed dry food and wet food to their kitties? I have been feeding wet food in the evening to my girls as a treat and a way to get more liquid into their diets since they were kittens. Lately they don’t seem interested in the wet food. Do you think wet food is necessary and if not how do you ensure adequate water consumption without wet food? Thanks! Charles Steele: My get wet food 3 to 4 times a day brynhild 5 to 6 times a day and dry overnight. They do need the wet food. Heidi Hammond: Make sure you have multiple water bowls in different spots around the house. Also consider getting a fountain. My kitties love it! Aleena Alvarez: I feed my cats wet food twice a day and always have dry food out for them to nibble on. I’ve had cats for many years and have always fed them this way. Julie Taylor: I feed half and half. Dry food tends to be quite addictive to some cats and is very calorie dense so you do need to be quite vigilant about amounts. Sometimes you have to try a range of different wet food before you find one they will reliably eat but it is worth persevering as the cat’s digestive system was not designed to cope with a totally dry diet (not saying it can’t be done successfully just takes very careful management). Elliana May: I feed dry and they get a tablespoon of wet each. The beg for it then take a few licks and walk away. Aleena Medina: I own a health food store for dogs and cats in Florida and specialize in cat and dog nutrition. Cats are obligate carnivores and need meat to thrive. I feed my 8 cats freeze dried raw, frozen raw and canned food. 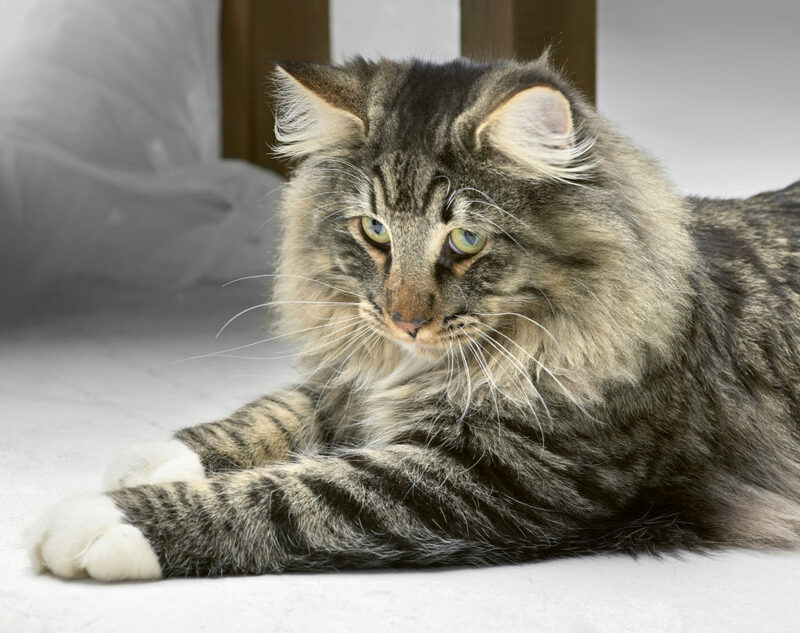 Kibble is not really a great food for cats, as it can cause urinary and kidney issues. If you are to feed dry food, choose a high quality, high protein kibble like Orijen or Farmina or Rawz. Check out the coat on my Julius! Finn Adkins: Their diet should include both. Annabelle Murray: My Cocoa will NOT eat wet food. He does, however, like finely minced ham mixed with mayonnaise. Morgan Sims: I hope you and Cocoa are doing better now. Annabelle Murray: Thank you Kimberly! Our lives are in a much better place! Jane Barber: We soak dry food in water for several hours, then warm it up in the microwave. I have a few cats who choose to take light or no meals sometimes. As long as it doesn’t go on for days I don’t worry about it. Aaron Cummings: I personally suggest only feeding wet or raw. Kibble is heated up far too much before being pressed and that breaks down important proteines which after have to be manually added again, if your cats wont have wet food at all try feeding them some raw bits a day or adding water to the dry food. In that case i suggest finding grain free dry food tho. Alessandra Hanson: They are so adorable! !I feed my cats canned food every evening and leave dry food out during the day. I have always heard that it’s best for cats to have some wet food in their diet. Alice Hudson: My girl eats dry food and we give her treats at least 5 times a day. And she drinks water and milk she’s 5. Adelaide Dawson: Raw food diet. Aaron Cummings: Sadly Kibble is bad for teeth, is a old thing people still believe, instead cats dont really… chew anyways the kibble just causes lots of tartar. They just crack the kibble in half. If you want to do something good for kitty teeth try dried meat. Morgan Sims: Dry food is never the best food. Even the most high end brand can’t make up for the lack of moisture in it. Dry food cleaning teeth is a myth. In fact the carb residue left behind by the dry food encourages the growth of tartar and plaque. Ember Hill: It’s a fallacy that dry food is good for teeth. Jaden Rogers: I adopted Zaphod as a special needs cat due to his history of having crystals in his urine, so having a dry-only diet isn’t an option. My two prefer Earthborn wet food morning and evening (into which I pour another can’s worth of water) and they get a quarter cup of Wellness Core dry food right before bed. (This is because I like to sleep.) I would try diversifying their wet food— feeding one variety or texture gets boring after awhile no matter how much they like it. Cecelia Pierce: I have in the past had cats and fed only dry kibble. High quality food is key regardless if dry or wet. Currently leave dry out, supplement with a wet meal once per day, sometimes every other day. Graham Shaw: Dry only. It solves a host of problems. Morgan Sims: Quite the opposite, dry food causes the problems. A high carb diet is bad enough for humans, imagine it for a strict carnivore. They may drink more while being on a dry diet but they still don’t get enough moisture to support all their bodily functions and live in a constant state of low level dehydration which can lead to bladder and kidney problems. Abel Reeves: I feed primarily wet – Nature’s Variety Original Grain-Free. And then I keep dry – Wysong Epigen 90 out for them to nibble. It’s mostly meat. Gwendolyn Doyle: I feed strictly raw. When he was little we fed dry and wet and he wasn’t doing so well so we decided to try raw. Never going back to kibble again. Our boy is thriving! He is big and not fat but muscular. His teeth are white, his furr is soft and shiny and his poops are not stinky and soft as they were on kibble. Besides, there’s nothing better than to watch him munching on a chicken neck and making those happy growling noises 😀 He doesn’t drink water much even though I always have a bowl of fresh water out. He gets all the moisture from the raw meet and pees a couple times a day. I am so glad we ditched the kibble and went raw. Morgan Sims: Yes! Never going back to kibble either and try to inform people how bad it is. Gwendolyn Doyle: Morgan Sims: me too but people don’t take to it that well here were I live (Croatia). :/ They’re afraid to feed raw meat. Gwendolyn Doyle: Shiny raw fed teeth 🙂 Morgan Sims: Yeah, it’s tough. Big pet food manufacturers have us brainwashed into thinking anything other than kibble/canned is bad and not safe. I keep trying though. Kassidy Kelly: What TYPES of raw food? The kind your order online? Or do you make your own? I’ve read homemade raw diet is lacking essential nutrients cats need. 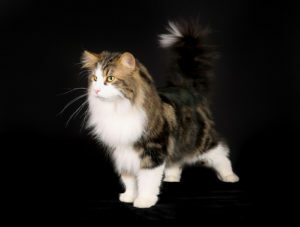 Teagan Black: Handsome cats!More important for males. I feed moist in AM, dry in PM. Gia Simpson: Look at those ear furnishings! Absolutely gorgeous girls! Gwendolyn Doyle: I love raw feeding, it does wonders for my boy. We plan on getting an NFC at the end of this year and he/she will also be raw fed. It’s more work than feeding kibble because we don’t have premade raw here so I have to prep and balance the meals myself but it’s totally worth it. Morgan Sims: It is! You can join groups like CatCentric, Feline Nutrition and Cats Completely Raw And Proud (Cat CRAP) for info, recipes and advice. Myles Kelley: When I got Matt The Cat from the RSPCA they informed me he needed a dry only diet due to dental issues. I have a water fountain so the water is always running, he seems to drink plenty but he was hesitant at a still bowl of water. Saylor Wagner: Cats can use both. Solely dry food over time can contribute to kidney disease. Moist and dry food provide a balance. The moist provides more liquid. One of our vets here says to provide more moist vs. dry because that also helps weight control. Try various brands if you can. I have a 10 year old short hair who was feral/rescued/adopted by us 9 years ago. She had a beginning “high” kidney issue at age 3. (After several brands that she hated, found she loved K/D, especially the Ocean fish). Began her on K/D support/moist and dry in smaller 3 oz cans: tuna and chicken. Also Epikitne supplement powder for kidney support/one small scoop daily. ALL of her blood work since has been normal and vet said to begin supplementing food with “regular”, so I get “7+” moist food and also let her have the Epikitne powder in Fancy Feast broth each morning. She also gets 7+ dry. Our nearly 4 year old NFC gets Royal Canin “Spay/Neutered Appetite Control” both wet and dry, as well as “Savor” in wet and dry. Just try different moist brands. The mix is beneficial, according to the 4 vets we have here. Saylor Wagner: Myles Kelley: A couple of other points: Our two kitties …above….do not like to drink out of a bowl. I use low plastic or glass tumblers; 4 in the house, changed daily- one in MBR. One on stair case. One by their food downstairs. One in a guest room. Also, use a Dental Additive called Tropiclean – available on Amazon. Usually around $10/bottle. Lasts the two of them up to 4 months/one capful per glass. (Used also for a few years at our local shelter). Myles Kelley: Thankyou Penelope. Matt The Cats diet is just fine and I was merely responding to the question asked in the original post “Do you think wet food is necessary and if not how do you ensure adequate water consumption without wet food?” tHANKYOU. Joseph Rowe: My boy stubbornly insists on eating mostly dry, but in the evening, I give him some of his kibble (only 1-2 tbsp) with hot water added (it cools almost immediately) and he some to enjoy it. It’s part of my strategy to get him liking his food wet more, so that eventually he’ll willingly eat more wet than dry. Omar Nelson: Beautiful babies. Yes, cats need wet food because kibble is dehydrated food. I feed mine human grade tuna, chicken broth, etc to keep the moisture in their diet. Big reason cats have frequent kidney failure if not given quality wet food. Andrea Ball: I’ve always fed dry food only because someone told me when I was very young that wet food can be associated with urinary tract issues and that just stuck with me. My babes love water though, so dehydration has never been a problem for us.